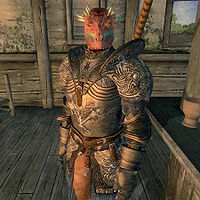 Jee-Tah is an Argonian warrior who can be found talking to the people of The Lonely Suitor Lodge in the city of Bravil. He is part of the Blackwood Company. Although he is a member of the Blackwood Company, Jee-Tah is definitely not one of their more active members. He simply spends all his time wandering around The Lonely Suitor Lodge, gossiping with anyone else that happens to be around. He never leaves the inn and does not even stop to eat or sleep. During the Fighters Guild quest More Unfinished Business, he will follow Maglir around at all times. At the end of this quest he is disabled and will therefore disappear from the game. He wears a Blackwood cuirass, gauntlets and shield, tan linens and a pair of doeskin shoes. He is armed with a blunt weapon and carries a spare quilted doublet and a small amount of gold. This page was last modified on 25 March 2018, at 02:57.